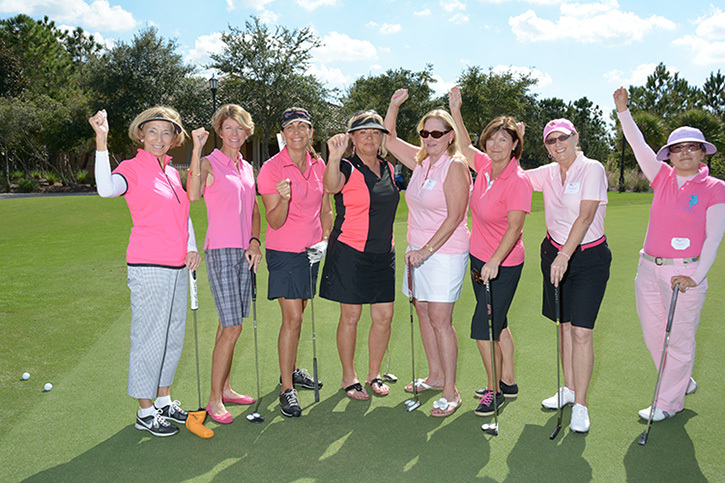 The mission of Women Playing For T.I.M.E.® is to partner with Orlando Health Foundation in support of Orlando Health UF Health Cancer Center to defeat cancer as it affects women and their families and friends. We are grateful for the leadership of dedicated community volunteers who host fundraising events in support of WPFT throughout the year. Philanthropic support, large and small, powers every life-saving treatment, and breakthrough discovery at Orlando Health UF Health Cancer Center. Be our partner in making the extraordinary advances that will save countless lives. With your help Women Playing For T.I.M.E. can continue to grow to meet the needs of the Central Florida community today and in the many years to come. Send an electronic card to your loved one(s), letting them know of your tribute gift. If paying by credit card, please use your billing address. Title:* Mr. Ms. Mrs. Miss Dr.
Will this donation be potentially matched? If yes, please enter the company name below. I am an Orlando Team Member. I would like to receive e-communications from Orlando Health. *PLEASE CLICK ONLY ONCE. Every time you click "Make Your Secure Donation" a donation will be sent. If you have made a donation in error please contact the Orlando Health Foundation Gift Processing Department to be issued a refund. We appologize for any errors you may encounter and thank you again for your gift. A COPY OF THE OFFICIAL REGISTRATION AND FINANCIAL INFORMATION FOR ORLANDO HEALTH FOUNDATION, A FLORIDA-BASED NONPROFIT CORPORATION (REGISTRATION NO. CH577), MAY BE OBTAINED FROM THE DIVISION OF CONSUMER SERVICES BY CALLING TOLL-FREE 1-800-HELP-FLA (435-7352) WITHIN THE STATE OR VISITING THEIR WEBSITE HERE. REGISTRATION DOES NOT IMPLY ENDORSEMENT, APPROVAL, OR RECOMMENDATION BY THE STATE.